Last month our corporate art department created a digital image to advertise the For Always paper pack on our websites. I saw the ad and instantly fell in love with the adorable image of the For Always paper pack being used as clouds raining little hearts. I took that inspiration and created a canvas for my own home decor for this week's challenge "Rain Drops Keep Falling on my Head" at Heart2Heart Challenges this week. 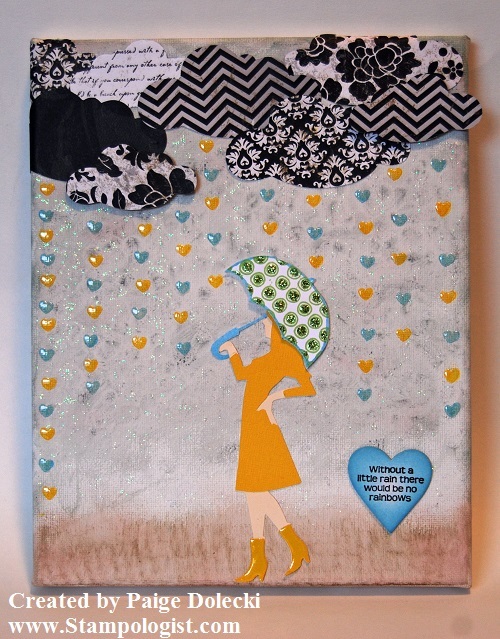 I think this is a great little inspiration piece for my home - especially as I live in the very rainy Seattle area! I used some Gelatos on my canvas to create the gray and brown background. I used my stamp scrubber pad to texture the ground and my finger tips to textured the gray skies to look like sheets of rain. 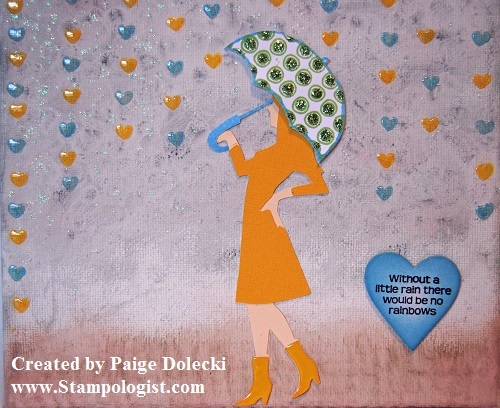 I stamped the hearts using our pigment inkpads in Honey and Crystal Blue directly to the canvas. After they dried I added some Liquid Glass for shine and Stardust Glitz Gel between for a shimmery effect. The girl is actually a witch from the "Frightful Affair" cartridge. I cut off her witch's hat and cauldron - I loved those boots - perfect in honey with some Liquid Glass to look like rain boots for a fashionable lady. 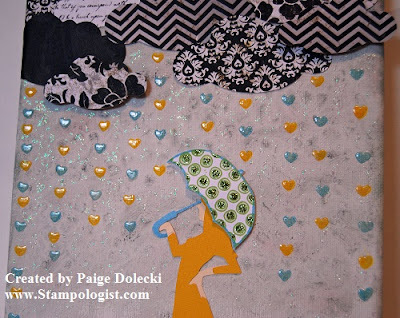 The umbrella is from a retired set called Springtime stamped in Sweet Leaf and Crystal Blue pigment ink with Green Glitz Gel added to the dots. I hope you'll join us at Heart2Heart Challenges this week and create your own "Rain Drops Keep Falling on my Head" project! 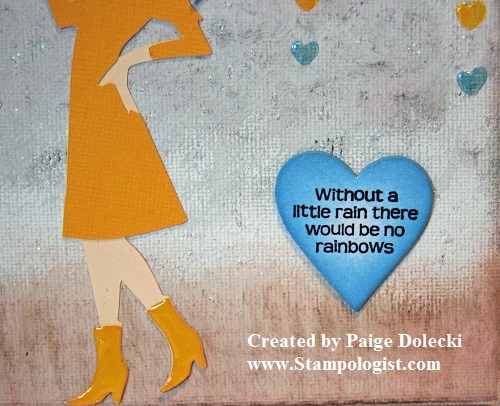 What a fun way to celebrate the April showers we all get - can't wait for those May flowers!